Normally it is best to use the By Helper Schedule View to edit, delete, clone or assign shifts because it allows you to quickly make changes without the page reloading. To delete a shift on that view, you can click the shift, and click the DELETE Shift button in the upper left. Deleting shifts is permanent and they cannot later be restored. To delete more than one shift, it may be more convenient to use the Sortable List schedule view. 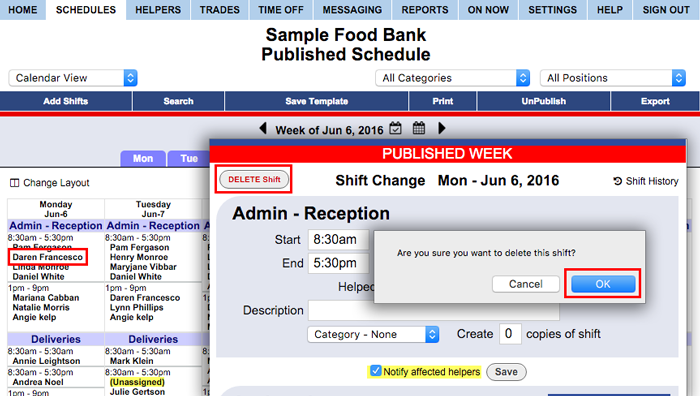 If the shift was on a published week, any affected helper may be automatically notified.